Cannabis is quickly becoming the wonder-drug being used to treat a growing list of pains, aches, and diseases. Now, it is apparent that the 1.6 million American citizens living with an inflammatory bowel disease (IBD) such as Crohn’s disease and ulcerative colitis (1) could use it to treat their conditions. In basic terms, IBDs are inflammatory bowel diseases that cause chronic inflammation and damage in the gastrointestinal (GI) tract. Crohn’s disease can affect any part of the GI tract, but will commonly impact on where the small intestine joins the colon. This inflammation leads to the intestines being unable to process any food eaten, or absorb water properly. This, in turn, can result in loose stools and sometimes result in severe weight loss. Most people will suffer from severe abdominal cramp pain, constipation, and in some cases, the formation of ulcers which can lead to rectal bleeding (1). Unfortunately, the disease is incurable but can be treated, with symptoms relieved and reduced through changes to diet or use of steroids. However, much of the time, people are left to manage the condition on their own, and make the most of the painful symptoms (4). This is where marijuana could come in and provide relief from the debilitating symptoms of IBDs. For thousands of years, people have been using marijuana for medicinal purposes to treat a variety of ailments. In recent years, its use as a medicine has seen a resurgence with 25 states legalizing its use for medical purposes (2). Even more recently, both ulcerative colitis and Crohn’s disease have qualified for treatment by medical cannabis (4). The reasons behind this appear to be that marijuana is incredibly effective at limiting intestinal inflammation (4). According to The Crohn’s & Colitis Foundation of America (CCFA) in 2012, compounds in marijuana closely mimic endocannabinoids – molecules that appear naturally in the body (5). It is these very compounds that are thought to play the key role in limiting intestinal inflammation. In turn, this leads to a decrease in cramping, as the muscles relax (4). Further, IBD sufferers have been found to have more cannabinoid receptors in the colon’s tissues than people who don’t have IBD. As such, they respond much better to the chemical compounds in medical marijuana, benefitting from their anti-inflammatory properties. There have been various studies into the effects of marijuana on patients suffering from IBDs and all of them show patients responding positively to marijuana’s effects on the symptoms of their conditions. One 2014 study surveyed 292 patients, composed of a mixture of current-, past-, and never-users of marijuana. The patients that use it for disease symptoms reported that marijuana was “very helpful” for relief from abdominal pain, nausea, and diarrhea (6). Half of the never-users showed interest in using marijuana for abdominal pain. An earlier study from Tel Aviv University, Israel, actually treated Crohn’s disease patients using marijuana, though used a considerably smaller sample. 21 Crohn’s sufferers who hadn’t responded to therapy with steroids were selected, and half were assigned to a cannabis group, with half in a control group. As touched on in the last study, the effect of increased appetite on marijuana users has a significant impact on their ability to gain and maintain weight. In a study from Chaim Sheba Medical Center, they found that just three months of treatment inhaling cannabis, was enough to significantly improve the quality of life of IBD patients (7). They found that is also lead to weight gain and a rise in the BMI of long-standing IBD patients. Furthermore, they reported a greater ability to: work a regular job, maintain a social life, perform daily tasks, coupled with a decrease in their physical pain and mental anguish (7). This weight gain and the general improvement of the quality of life are both indicators of the benefits of marijuana’s medical use in people with IBDs. As indicated earlier, the issue of weight-loss and the impact that the disease has on the lives on those suffering with it, in addition to the physical pain of the condition itself, is very problematic. Perhaps in light of all the research, and with Crohn’s now added to the list of conditions treatable with medical marijuana, more people will discover and benefit from its hugely positive effects in the near future. 1. THE FACTS ABOUT Inflammatory Bowel Diseases – CCFA. ccfaorg. 2014. Available at: http://www.ccfa.org/assets/pdfs/updatedibdfactbook.pdf. Accessed September 7, 2016. 2. 25 Legal Medical Marijuana States and DC – Medical Marijuana – ProCon.org. Medicalmarijuanaproconorg. 2016. Available at: http://medicalmarijuana.procon.org/view.resource.php?resourceID=000881. Accessed September 7, 2016. 3. Lal S e. Cannabis use amongst patients with inflammatory bowel disease. – PubMed – NCBI. Ncbinlmnihgov. 2016. Available at: http://www.ncbi.nlm.nih.gov/pubmed/21795981. Accessed September 7, 2016. 4. 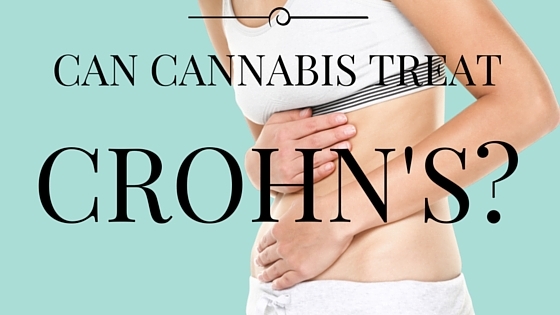 Cannabis Shows Promise as a Treatment for Crohn’s Disease and Colitis. Hellomdcom. 2016. Available at: https://www.hellomd.com/health-wellness/cannabis-shows-promise-as-a-treatment-for-crohn-s-disease-and-colitis. Accessed September 7, 2016. 5. Crohn’s & Colitis Foundation of America (CCFA) – Medical Marijuana – ProCon.org. Medicalmarijuanaproconorg. 2016. Available at: http://medicalmarijuana.procon.org/view.source.php?sourceID=000412. Accessed September 7, 2016. 6. Jessica Ravikoff Allegretti J. Marijuana Use Patterns Among Patients with Inflammatory Bowel Disease. Inflammatory bowel diseases. 2013;19(13):2809. Available at: http://www.ncbi.nlm.nih.gov/pmc/articles/PMC4126607/. Accessed September 7, 2016. 7. Lahat A e. Impact of cannabis treatment on the quality of life, weight and clinical disease activity in inflammatory bowel disease patients: a pilot prospecti… – PubMed – NCBI. Ncbinlmnihgov. 2016. Available at: http://www.ncbi.nlm.nih.gov/pubmed/22095142. Accessed September 7, 2016. 8. Sciencedirectcom. 2016. Available at: http://www.sciencedirect.com/science/article/pii/S1542356513006046. Accessed September 7, 2016.